A mighty torrent of news! Doc: "A year from now every newspaper will have a newsriver." I think so too because: 1. The idea is so compelling and 2. It's so easy to implement. Thanks so much to Doc Searls for writing a great evangelical piece about the power of rivers. The stream is turning into a current, and soon really will be a river. It’s so weird to see rivers show up in Facebook, and Twitter is just a big river of all the people you’re following. 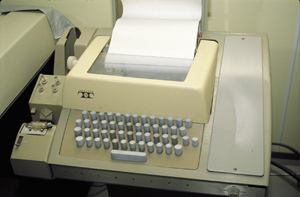 The idea is actually a descendent of the teletype terminals that used to be in the movies (and for all I know in actual newsrooms). The news was printed on scrolls of paper, and when a new story came in it would push the older stories onto the floor. You could catch up on the news by scrolling back through the news. 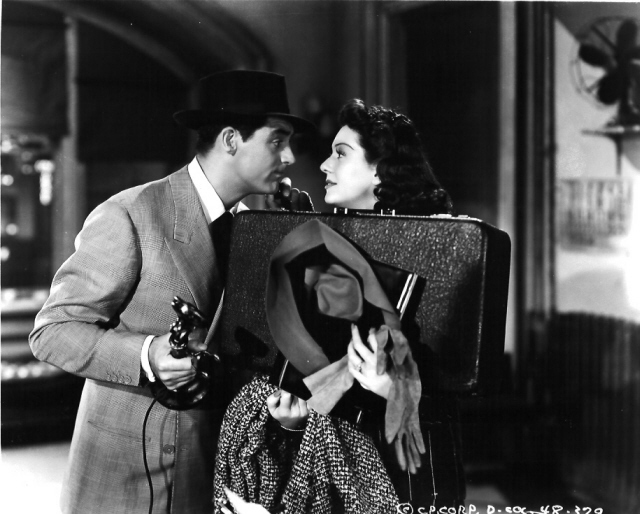 Cary Grant, Rosalind Russell, Katherine Hepburn did it. We’ll all be doing it soon enough. And it really helps to get other people singing the song, esp from within the hallowed halls of Harvard. The more attention we get focused on it, the more other developers will tune in. And what may not be so clear from the narrative is that this project got its start from a meeting I had with some technical people at the Times last week in NY. Like most organizations, it's not of one mind, there are people who are scared of what comes next but there are others who know that the Times has to change. By opening up their internal data to me, all kinds of interesting stuff can happen. We've been here before. The Times are the unsung heroes of RSS, without them it never would have solidified, with the publishing industry falling in behind the Times. It was this consensus that created critical mass for RSS 2.0 in 2002 and 2003. I really hope some of this stuff feeds back into the Times support of RSS. And as you have seen, there are now lots of new opportunities in user interface for news. This is what I do, when I'm in my "flow" -- we're there now again, with a new toy to build and then play with, every day. Betsy Devine: "Dave Winer has been improving the New York Times for as long as I’ve known him." Phil Windley: "With more sources, who are themselves continuously updating, the keyword river could be as dynamic as you’d want it to be." Last update: 10/19/07; 8:37:17 PM Pacific. "It's even worse than it appears."